We examine in depth your Electro-Magnestic Inner Aspect and Field, as well as your energetic System of Acknowledgement. Welcome to Workshop Two of the ONA Workshop Series. In this workshop, we will study Acknowledgement, the second principle of ONA and the principle that underlies your Electromagnetic Field and Inner Aspect, and System Two. All about your second System, Field and Inner Aspect. The purpose of Acknowledgement is giving of yourself to your Self, an action of expanding beyond the present experience. In this is the process of knowing where the self is and how it got there. This places the self in an slice of time and space. By acknowledging the self you are remembering the "more" of who you are. How to meditate using the 12-Fields Breath. This breathing technique is useful for meditation or simply raising your vibrational frequency for increased clarity, and can be done anywhere that breathing is permitted! All about the color of Acknowledgement (infrared, or bronze/tan if that&apos;s easier for you to picture). The color of the Second System is infrared; but, as people cannot directly perceive this color, use a bronze or tan color as substitute. These can represent Earth colors, lighter flesh tones, neutrality, and movement, as in shifting sands and flexibility with other colors. 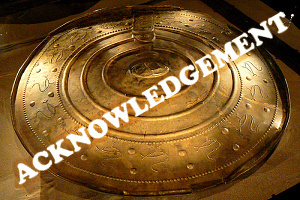 The &apos;sound&apos; of Acknowledgement and how to use it. The wholeness of all and the potential flow of energy between every part. This flow is a process of balancing. The Greater Self receives, processes, lets go and gives back by directing the flow into the openness of the Eternal Self. Neutrality allows inclusiveness. How to perform energy therapy on another person. Besides being able to direct this energy for your own personal use, it can be shared with others. One of the ways to share is to give another person a session. When working with others, the neutral viewpoint is very important. Being and keeping centered while allowing the greatest view possible will facilitate the most expansion for everyone. Before you start any session, do a complete session on yourself by using breath and sounds to center yourself. The greatest goal while working with others is to support them to know themselves better. Healing can only be done by the individual self. You and this energy are there to facilitate the remembrance of wholeness. There are guidelines to enable a balanced flow of energy and comfort to all. Using ONA techniques to provide physical care to others; how to absolve yourself from past karma. There are levels of physical pain, as well as levels of awareness regarding injury and pain. These may range from a not-yet-painful erupting pimple, to a major wound. In each case, you need to recognize that any physical pain that the body experiences includes some level of unconsciousness. You heal much faster when you are more aware of what is occurring. You can learn to direct others to examine their energies and focus, so that conscious awareness and life essence returns to any painful or numb area.